There is no doubt that the most concern area of a house is living room and next would be kitchen. Kitchen is probably a heaven for every housewives. 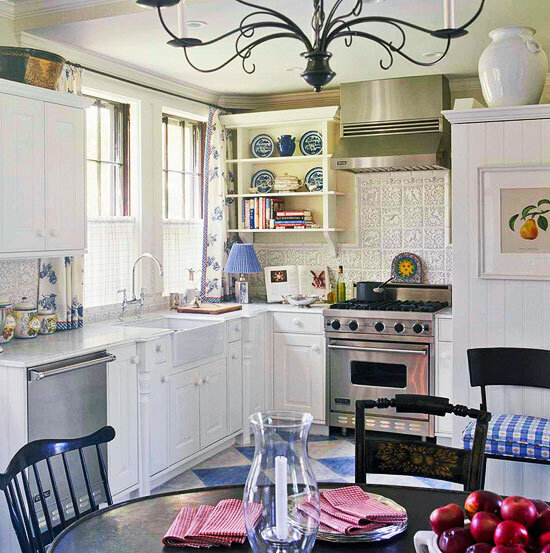 And a beautiful kitchen can inspire us to cook a delicious food. But, if you have a ugly and cramped kitchen, it may affect your emotion while do the cooking. So, today, we are going to share with you the 15 kitchen design ideas that you will love and you may apply one of these ideas into your kitchen although your kitchen is small size. This corner kitchen takes advantage of its snug parameters by opening up to the adjoining breakfast area, which is lit by tall glass windows and doors. 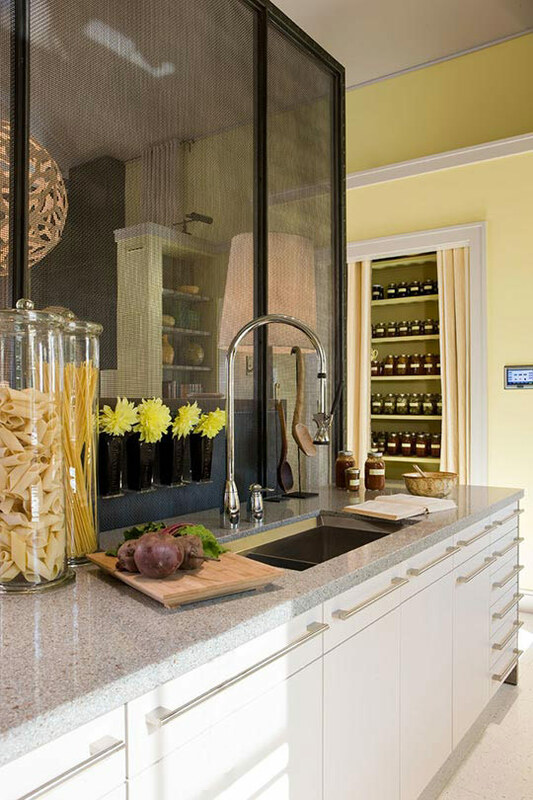 A spacious center island grounds the space and provides additional counter surface for food preparation and storage. The room’s palette of white and powder blue keep the mood light and fresh. Often the hub of the family home, the kitchen is a place to gather, cook, eat, laugh, do homework or pay bills, and share in special moments together. When space is limited, it takes smart planning to create a multifunctional and aesthetically appealing kitchen. Here’s how to make the most of space you have. This kitchen shares a 42×21-foot space with the living room, which is separated by a ten-foot-tall mesh panel that is both subtle and effective. “It’s a translucent divider that provides a visual separation without blocking views, light, or conversation,” says designer Barry Dixon. 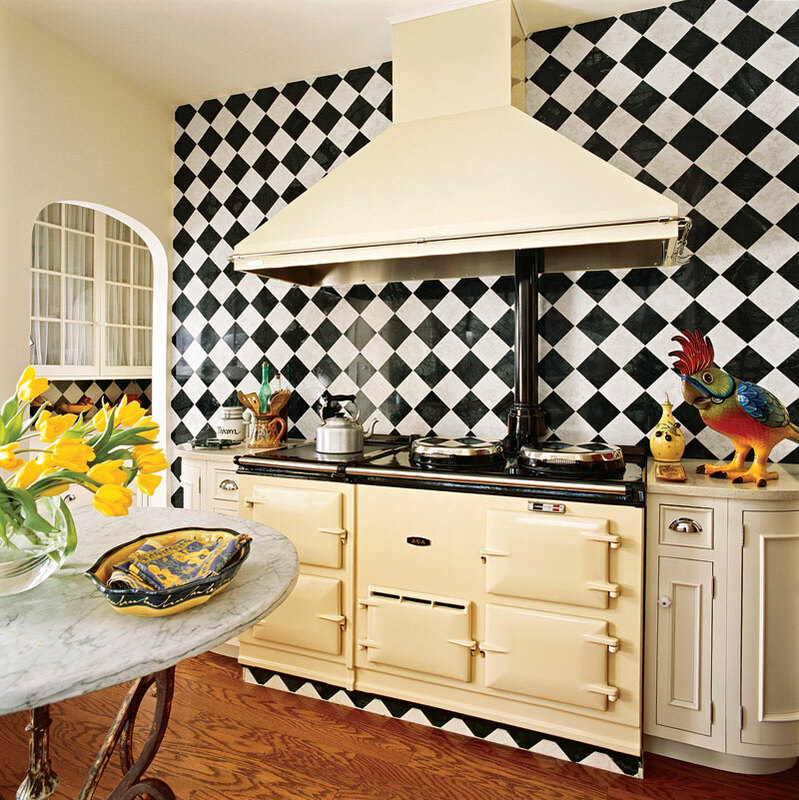 A traditional English-made Aga stove replaced the previous cooktop. The wall behind is set with a bold pattern of white and green tiles with chamfered edges for texture and color. A recent addition to this home bumped out the kitchen several feet on one side and allowed for a large center island. 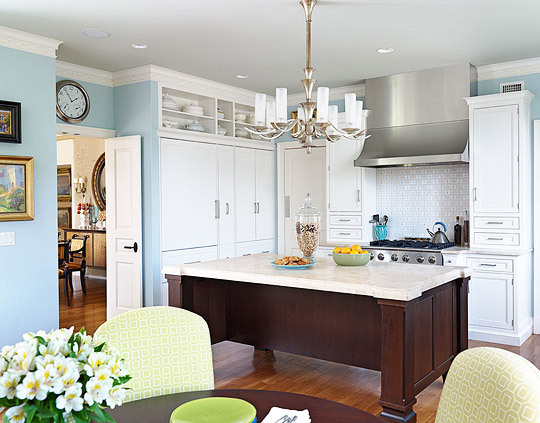 The walkway through the kitchen leads to a breakfast room with more seating. Wine is stored in cubbies below the island and across from the bar area. 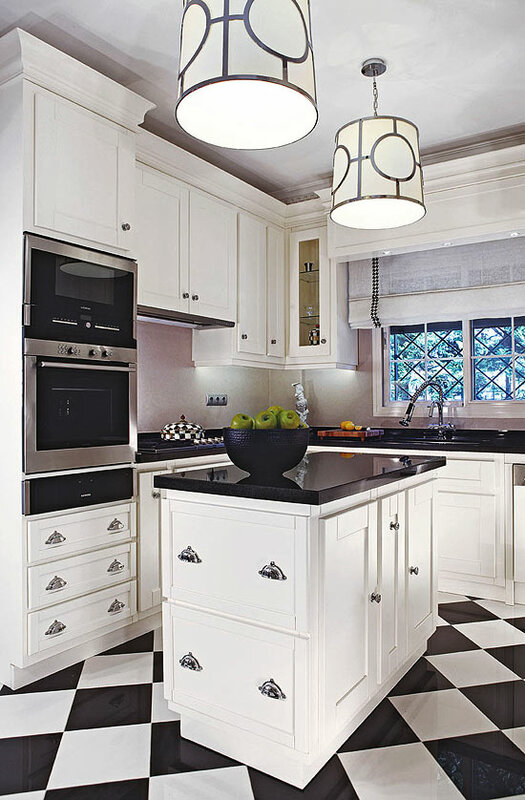 Clean white molding against crisp black granite countertops keep this kitchen feeling fresh. The black-and-white scheme culminates on the checkerboard tile flooring to lend interest underfoot, while contemporary light fixtures from Vaughan Designs lend a mod flair. Designer Eric Cohler lifted the spirits of this small kitchen in a renovated commercial building by giving it a sleek, James Bond look with a curved island. The Japanese lantern-style light fixture is an unexpected touch that keeps things from feeling too somber. 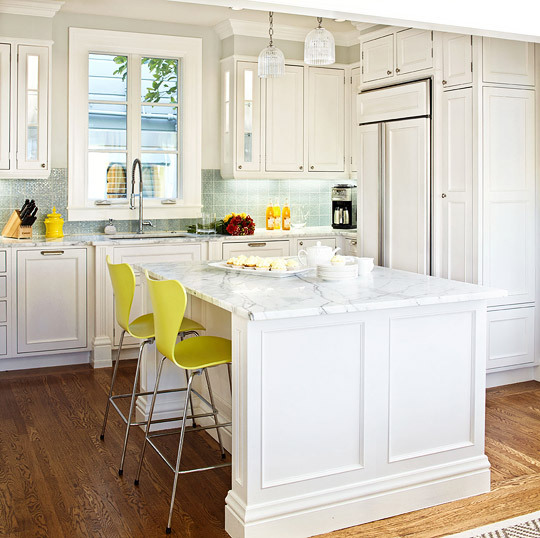 A simple kitchen with plenty of storage is appropriate for the home of Los Angeles chefs and culinary personalities Suzanne Goin and David Lentz. 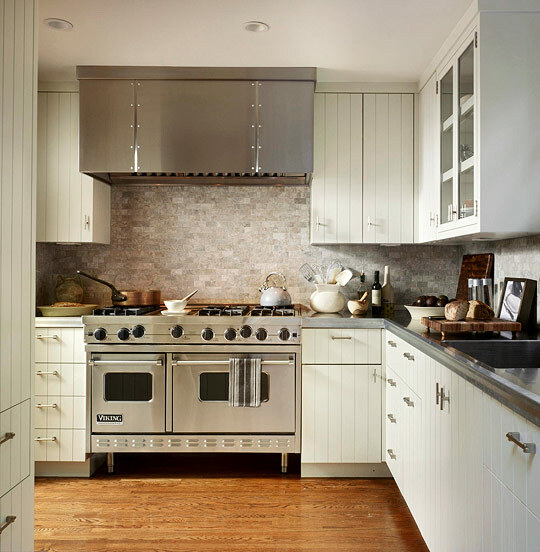 A stone backsplash in warm gray tones and pale sage cabinets visually counteract the visual coolness of the stainless steel, says architect William Hefner. The breakfast area carries the same graphic black-and-white scheme, this time with chair and bench fabric from Fabricut. A built-in banquette provides ample seating on three sides of the table while also saving valuable space. Wall sconces are a smart lighting feature. 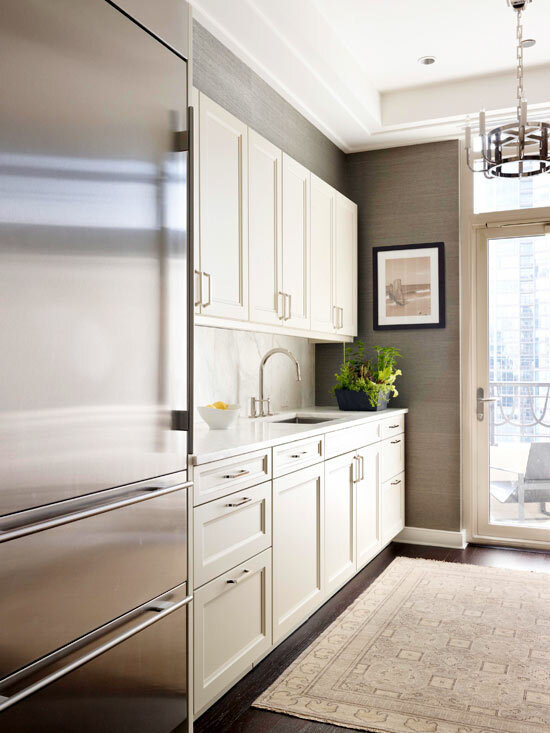 Kitchen designer Mick De Giulio created this kitchen for the Ritz-Carlton Showcase Apartments in Chicago. The rug contributes to the furniture look of the room in the apartment whose other rooms were designed by Frank Ponterio. “In these spaces, we didn’t want to do flat, austere kinds of kitchens,” Mick says. “Most of the finishes are lacquer, but there are also some wood finishes, and everything has sculpting or other details on the doors.” Large glass doors leading to a patio keep light flowing through the narrow room, while white paint and stainless-steel appliances keep the space bright. 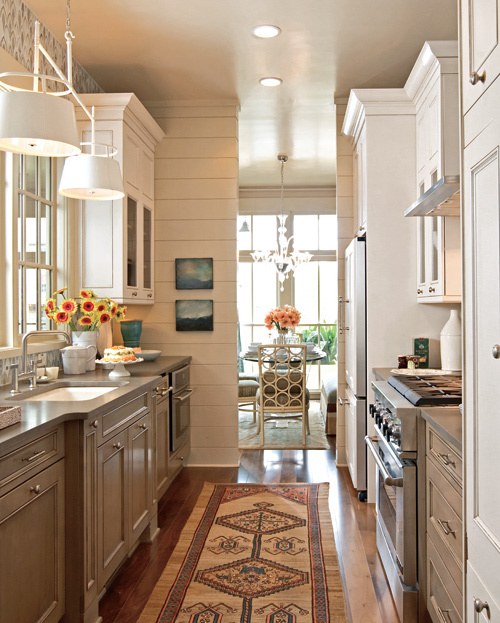 A recent remodel inspired the new palette of blue and airy whites, giving this cozy kitchen a fresh, country-chic look. New painted cabinets with a mix of open shelves and glass-front doors were added. A vintage-looking apron sink with bridge-style faucet blends easily with a modern stainless-steel stove, vent hood, and dishwasher. The blue-and-white color scheme is warmed by coral accents. 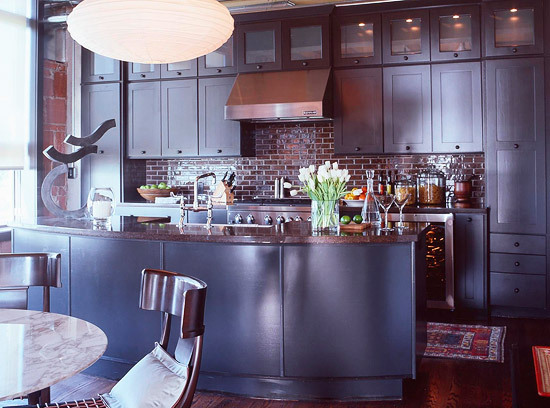 This apartment kitchen’s luxurious textures and high-shine accents make it live large. 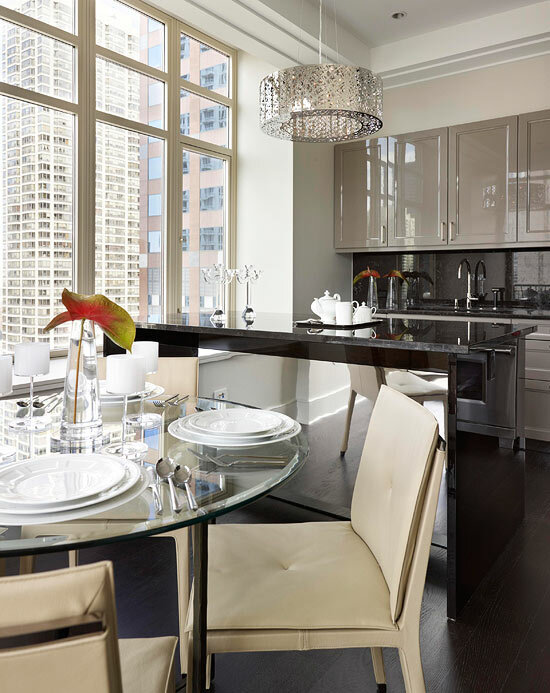 Designed by Mick De Giulio for Doug Atherley’s apartment in the Ritz-Carlton Showcase in Chicago, it’s bisected into cooking and dining areas by a handsome center island. The room’s amenities are all dressed in glossy finishes and state-of-the-art materials, giving the space a metropolitan vibe. Tall windows allow for sweeping views of the city and provide a beautiful focal point. White paint, marble countertops, and a sparkling blue backsplash give this kitchen a youthful glow. A large center island doubles as a dining table, while the simple molding on the cabinetry and windows keep the space feeling fresh. A pass-through connects the kitchen’s separate prep and eating areas, which are separated by a support wall. Calcutta Gold marble countertops in gray and white matching the backsplash sit on SieMatic contemporary cabinetry with a honey-tone finish. Awkward architecture in this New York apartment didn’t stop designers Benjamin Bradley and David Thiergartner from creating a practical and pretty kitchen. 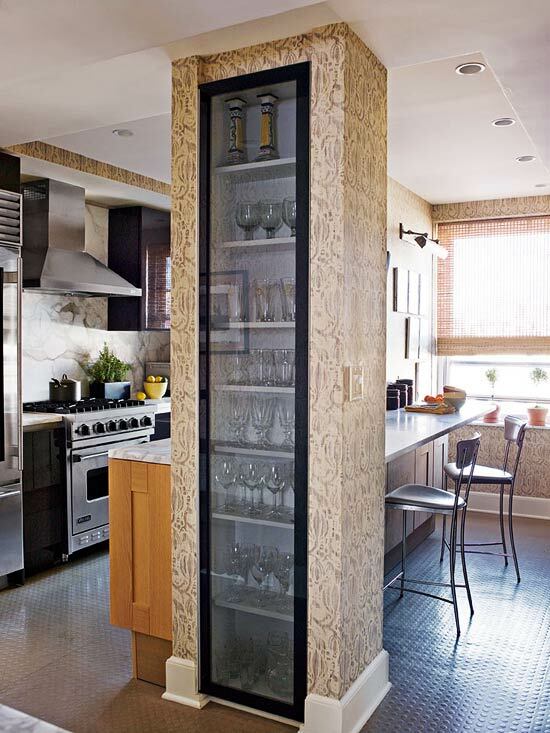 They disguised an unattractive support wall by cutting into it and adding shelves that house Lynn’s glassware, a solution that gives the impression of a design decision that was intentional rather than mandated by structural elements. 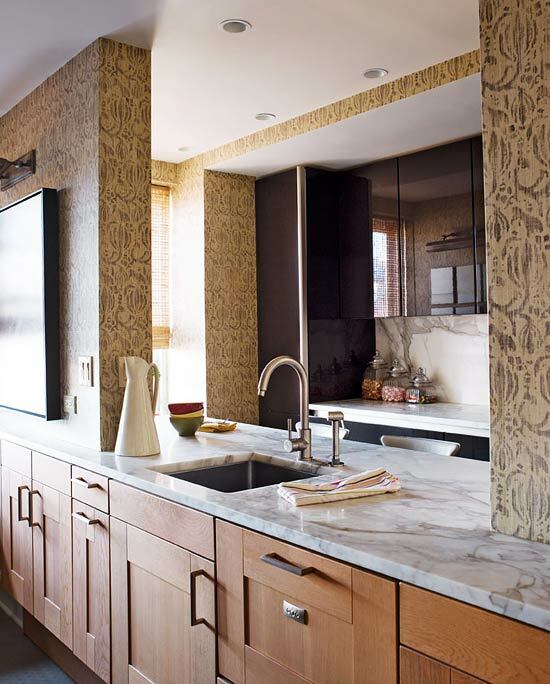 A sepia-toned wall covering with a faded batik motif by Rose Tarlow and rubber flooring that alleviates fatigue from standing on a hard surface help temper the sheen of stainless steel appliances. Have the above kitchen design ideas inspired you? 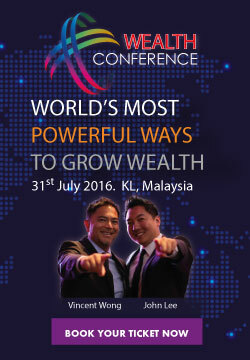 Forward this article to your friends and family to tell’em which one you prefer the most. Or comment below ⇩⇩⇩ to tell us your ideas that doesn’t appear at above.